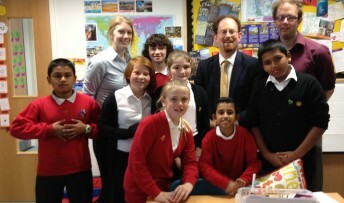 MP Julian Huppert will fight for more money for Cambridgeshire schools and sixth form colleges yesterday (Tuesday, January 8) told Parliament how the county’s children are paying for poor funding decisions made over the last 30 years. The county gets far less per pupil each year than the English average which means the county’s schools are short changed by a massive £34 million, Julian said. “Education should always be a priority,” he said when he led a debate in Westminster Hall on Funding for Cambridgeshire Schools and Colleges. “Whatever financial situation we find ourselves in, we must never bankrupt our children’s future – they only get one shot. Funding for Pre-16 Pupils in Cambridgeshire is currently funded through the Dedicated Schools Grant (DSG) at the rate of £4,643.51 per pupil. For the financial year 2012-13, this places Cambridgeshire as the 143rd lowest funded local authority of 151. This funding is to cover all spend for nursery provision, mainstream schools, special schools and all high needs pupils. A new approach will see basic school funding being separated from early years and high needs funding and the schools block funding for 2013-4 gives Cambridgeshire the least of any of the 151 local authorities – £3,950 per pupil per year; the English average is £4,550. “What possible reason can the Government give for why pupils in Cambridgeshire deserve 13 per cent less funding than across the rest of the country? Just think what our schools could do with an extra £600 for every pupil they have.” says Julian. The Lib Dems have put in place the Pupil Premium which provides £1.8 million to give 2,100 children from poorer backgrounds a fair start. The Premium has been well-received by local head teachers; they say it allows them to do things they have never been able to do before. He cited Chesterton Community College, where the Principal, Mark Patterson, has been able to fund specialist reading teachers, to deal with the few pupils each year who get to secondary school unable to read at an appropriate level. “But they are all deeply concerned about the tightness of the funding,” says Julian. One example he will give will be St Paul’s Primary School in Cambridge where the school has been working on an extremely tight budget. “Although they have been able to just about keep in the black, this has meant a gradual erosion of their reserves – the main issue being reduction in capital funding,” says Julian. “The school’s annual capital budget is about £7,000 a year. This means that the school’s management cannot maintain the standard of the fabric of the school site in the way they would wish. “The school field needs replacing as it is becoming a health and safety hazard with rubble beneath the soil gradually working through, and there are issues with drainage being affected by tree roots in the pipe work which they cannot currently afford to repair. He will also tell how Cambridge’s Long Road and Hills Road Sixth Form Colleges are struggling to keep their heads above water against a backdrop of poor funding. Sixth Form Colleges are required to pay VAT on goods and services (with some exemptions), whilst schools and academies are reimbursed for these costs. This costs the sixth form college sector around £30 million per year, which works out at roughly £320,000 per college. Julian will also tell how pupils at sixth form colleges are ineligible for free school meals which are offered to those at maintained school sixth forms, academies, free schools and at university technical colleges. And a recent announcement of a simplified pro-rata funding system from 2016-17, at a rate of £3,900 per student, means these colleges face a further budget cut of 13 per cent. “This pro-rata funding system is in reality only a re-distribution of funding between 16-19 institutions, saving nothing for the national purse,” added Julian. “But it does mean that sixth form colleges like Hills Road, who deliver large programmes with high success rates, will lose heavily. “I do not ask for favours, or for special treatment,” says Julian. “I simply ask for fairness; fair funding for Cambridgeshire pupils, so they no longer get the least per pupil in the country.